Here we identify the things that EA claims to achieve. It aims to increase our maturity (Effectiveness and Efficiency) with respect to Strategising, Roadmapping and Project Governance. Adopting EA is not about doing these things - it is about how we do these things. So, can we achieve all these things without utilising an EA framework like PEAF? The answer is, yes of course we can. If we have experienced Enterprise Architects and they are allowed to execute their role in the way they know to be efficient and effective they would have no reason to adopt PEAF. If we do get the mandate to utilise PEAF, will utilising it guarantee we will achieve these things? The answer is of course No. If our people are not given adequate training and time to understand it and/or if they are then driven to execute their role in ways that they then know are ineffective and inefficient then PEAF adoption would fail. So when seeking the mandate and resources to adopt PEAF we would have to say - If we don’t it doesn’t mean we will fail and if we do it doesn’t mean we will succeed. So why would we adopt PEAF? 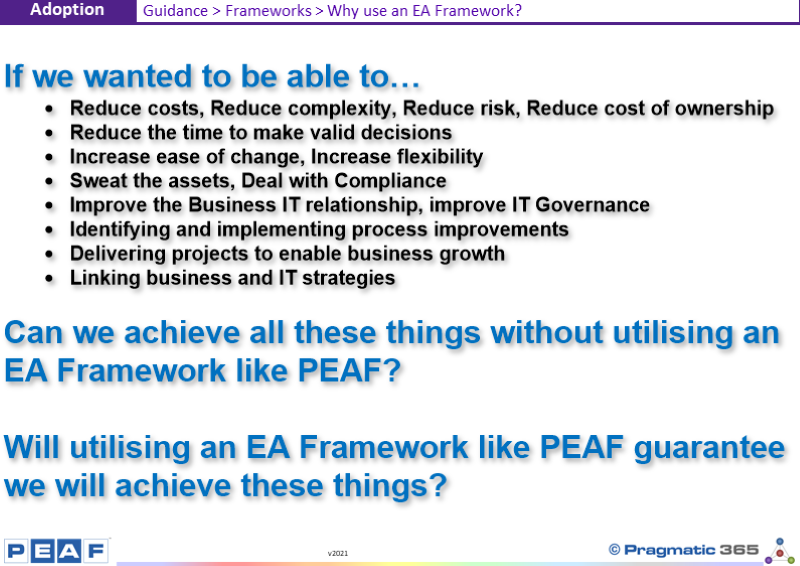 Like PRINCE2, PEAF is just an approach, a framework, a method for doing something. They are “tools”. Using them does not guarantee we will be successful. Not using them does not guarantee we will fail. We don’t have to use it - our Enterprise will not cease to operate if we do not use EA. But it is likely that we will be overtaken by those that do. However, today's world is changing… Effectiveness, Efficiency, Agility and Durability are becoming defining characteristics of successful Enterprises. As time passes our Enterprise needs to get more Effective, Efficient, Agile and Durable with respect to how we execute Strategising, Roadmapping and Project Governance or we will be overtaken by those that do. The 20th century was defined by a mind boggling array of new Enterprises. While new Enterprises and markets will always be created, the 21st century will be defined not by new Enterprises or markets but by how Effective and Efficient, Agile and Durable those Enterprises are. The question is not, can we afford to embrace EA? The question is, can we afford not to? Has your Enterprise adopted an EA framework? How was the mandate to do so secured? If not, who in your Enterprise, is Accountable for the EA capability?